With several different styles of roof available, you may be wondering what the differences are, and who to contact to repair or fit yours. Atlas Roofing Construction is a trusted and reliable local roofer Croydon and Surrey, experienced with all types of roofing services. Pitched roofing is a hugely popular type of roof with many benefits. A pitched roof has a slanted angle with the two pitches coming together to form the apex which means that water runs off the roof much more easily than a flat roof. Generally this means that a pitched roof will last longer as the roof will encounter fewer issues through it’s lifetime and will require fewer leaking roof repairs. Slates and tiles are also more durable than materials used for flat roofs. However depending on the angle, you may find that slates and tiles can slip out from time to time and you’ll need to carry out roof repairs on this. How are pitched roofs constructed? Tiles or slates are secured to the roof batons, on top of breathable roof felting which helps reduce condensation in your loft. Velux Windows are a lovely addition to a pitched roof, so talk to one of our local roofers in Croydon or Surrey about adding Velux Windows to your roof. Atlas Roofing Construction has been carrying out pitched roof repairs in Croydon & Surrey since 1986 and specialise slating and tiling so get in touch today for your free estimate. For over 30 years, we have been one of Croydon’s most trusted and highly recommended roofing contractors with most of our business coming from the referrals of our happy customers. In addition we always offer our customers a clear and transparent roofing cost. Pitched Roof Sutton Local Roofer Croydon & Surrey – Sandtoft Tuscany clay plain tile. We are proud members of the NFRC (National Federation of Roofing Contractors), and a Which.co.uk Trusted Trader. In fact you can see what some of our customers have said about us on our testimonials page or visit our Google Business Page. 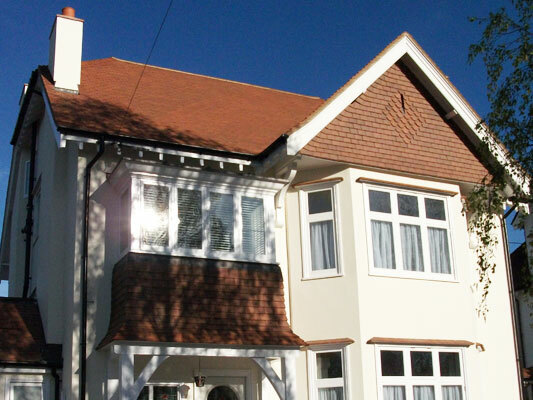 So get in touch if you’re looking for an experienced roofer Croydon, Surrey or London! for your FREE roofing cost estimate!